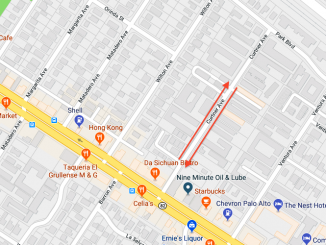 A south Palo Alto resident encountered a burglar inside her home, who fled and is at large, Palo Alto police said today. 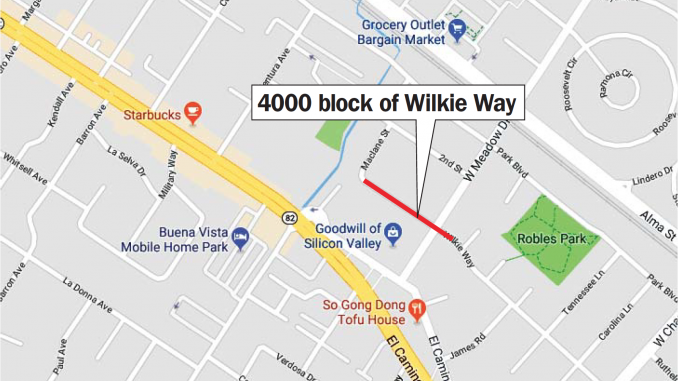 On Tuesday at 11:36 a.m., police got a call of a burglary in progress in the 4000 block of Wilkie Way. The female resident reported that a man had entered her home and then ran away when he saw her. Officers arrived and conducted a search with a police dog, but were unable to find the burglar. The woman heard her doorbell ring at around 11:30 a.m. and saw that a person was standing in front of the door, according to police. The person also knocked, but the resident chose not to answer the door, and returned to another area of the house. Shortly, thereafter, the victim encountered a man standing in her living room. She yelled at him to get out of her house, at which time the suspect fled. It appears the man entered through an unlocked sliding back door, police said. He did not take any belongings and his whereabouts are unknown. The victim described the man as a Hispanic male, between 17 to 21 years old. He was around 5 feet 8 to 11, weighing 150 pounds and was wearing a grey baseball style hat. Detectives are actively investigating whether this incident is related to an interrupted residential burglary that occurred on the 300 block of Curtner Avenue on June 30. Anyone with information about this incident is asked to call police at (650) 329-2413. Anonymous tips can be e-mailed to paloalto@tipnow.org or sent via text message or voicemail to (650) 383-8984. If she had a gun and had killed this guy, police would have arrested her. But since she wasn’t armed he gets to do more home burglaries. If he had been caught and arrested, he’d be out of jail the same day on an “own recognizance” bond, and would get probation. There’s no downside to pulling a burglary in this town. An arrest is an inconvenience to them. But while burglars have free rein, it’s good to see that we’ve got our traffic patrol back. Priorities, yes sir ree.